When students return to school at Binford Middle School on Tuesday, September 4th, they will be the first people to walk across a freshly laid entrance made of permeable pavement, thanks to Binford’s Green School Initiative. As part of a National Fish and Wildlife Foundation grant, I have been working to provide watershed education to each grade level and will continue that effort with 8th grade this year. Binford’s Green School Initiative is a collaborative effort between the Alliance for the Chesapeake Bay and its partners to determine what type of stormwater best management practices (BMPs) were practical for installing on a 103 year old historical school building. Binford Middle School’s Principal Rickey worked with the Alliance and Richmond Public Schools (RPS) Facilities to choose which BMPs were feasible to install and would have the most impact. The final choices were: permeable pavement for the entrance, conservation landscaping in front beds, and a rainwater harvesting system for the northwest corner. Last spring, during a grade level planning meeting, I happened to mention the idea of a rainwater harvesting system that would capture roof runoff AND double as an art sculpture for a music and arts focused school. Art teacher, Kirstie Sadler, was also at that planning meeting and connected the Alliance with well-known sculptor, Paul Dispasquale, who recommended Matt Lively, a native Richmond artist known for his beecycles work. 7th grade students and art classes were invited to participate in an art contest to design this rainwater harvesting system. The designs were reviewed, and the winning idea was used as inspiration for the final design that is currently in the final phase of construction. The design is a series of five troughs that will slowly drain rainwater into the garden bed below. The troughs stand on skinny legs and have clouds attached to the front. 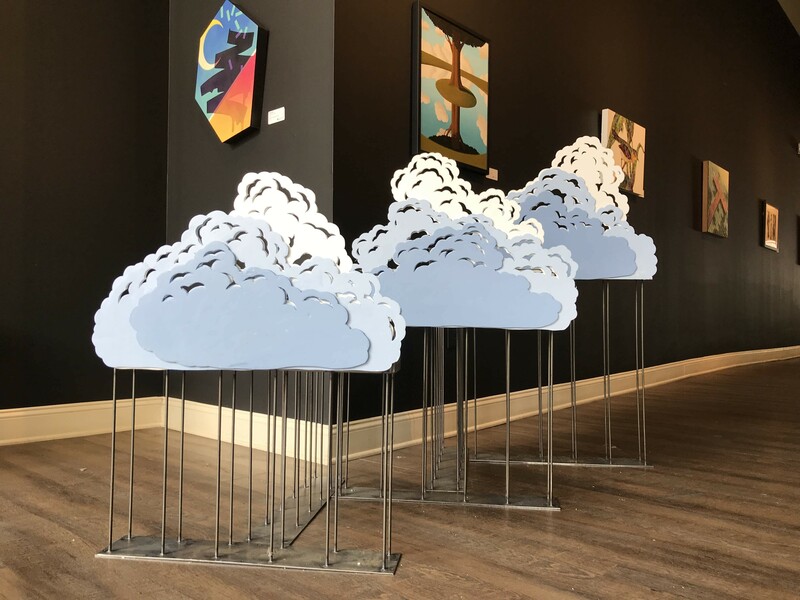 When viewed from Floyd Avenue, a popular through-fare in Richmond, the sculpture will appear like a cartoon squall. When not raining, teachers can still activate the system by using rainwater pumped from a rainbarrel connected to the lowest trough. It is the perfect combination of science, art, and environmental education. Landscapers plant Virginia native plants within the labyrinth walking path. 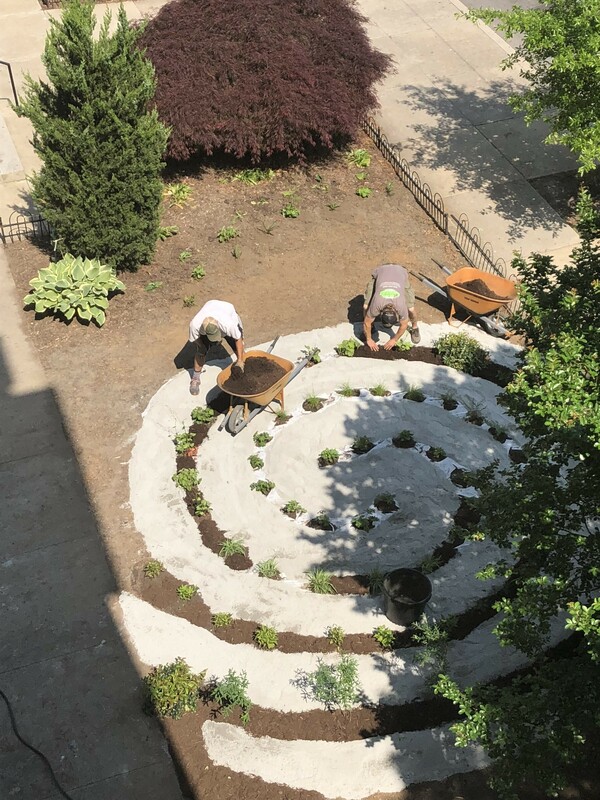 Besides a new permeable pavement entrance, and a rainwater harvesting system, Binford received two unique labyrinth walking paths, designed with all Virginia native plants. Scotty Dilworth, one of this year’s recipients of the Alliance’s Watershed Champion award, has worked several years with the Alliance. Her landscape design work can also be viewed on the northeast side of the school where she installed a rain garden. The entire project from the start has been teamwork and collaboration. All work done at Binford is custom-designed and functional, making it the largest green infrastructure project in RPS. Beyond being recognized as a RiverWise School, Binford also is part of the Turnaround Arts program in which professional artists adopt schools to help facilitate and enhance arts education. In Binford’s case, that artist is Jason Mraz, who grew up in Richmond, VA participating in the performing arts. The Alliance continues to update Mr. Mraz on our work with the school. The Alliance plans to use Binford as a model example of how other schools can use green infrastructure to improve and update the look of their school, but even more importantly, prevent pollution from entering our local waterways. In the Fan District of Richmond, where Binford is located, community is important to its residents and to the school. The Alliance will continue to build the feeling of community, and will use Binford to connect the next generation of environmental stewards to the community and the James River, only one mile away.